Amazon E-Gift Cards are my most-used payment method. Since these transactions are processed by Amazon.com, this is the most discreet way to pay. Amazon accepts most Debit and Credit Cards within the USA and abroad. 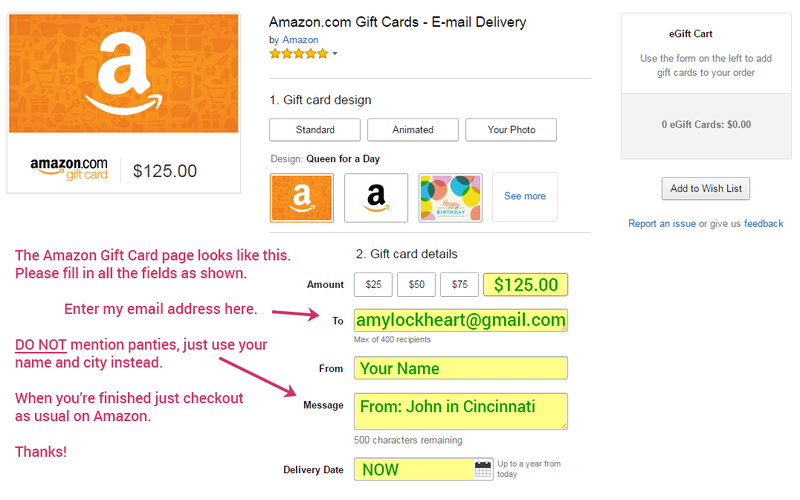 To pay via Amazon, Click This Link and follow these Simple Instructions. If you cannot pay with Amazon, I can sometimes accomodate Credit Card payments through my other business. I prefer to keep the businesses separate, so this is a last resort. But if you simply cannot pay with Amazon, email me and I'll provide details for using Visa, MasterCard, American Express, or Discover. Last thing... thank you for your business and all your generous gifts. I can't tell you how much it means to me.